Epilobium ciliatum. Paul Drobot.wisplants.uwsp.edu Robert W. Freckmann Herbarium, University of Wisconsin-Stevens Point. (Accessed 3/2014). 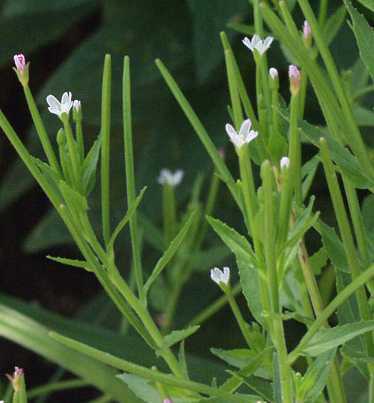 Epilobium ciliatum is a perennial herb from persistent basal rosettes, stems solitary, slender, branched, to 1 m or more (or only to 40 cm, in Fernald), finely hairy above, stems of inflorescence often glandular. Leaves opposite, sometimes becoming alternate above, lance-shaped, to 12 cm long, 3.5 cm wide, margin sparsely toothed. Flowers white to pink, radially symmetrical, petals 4, to 0.6 cm long, deeply notched at tip; blooms and fruits June-Sept.
Fruit dry, a 4-parted capsule, linear, to 10 cm long (to 3 cm in Fernald), seeds numerous, white-plumed, evidently wind-dispersed. Habitat: Moist to wet soil, often in unstable habitats. May be extirpated in NYC.